(but don't tell your friends about it). One of the great things about going to the movies is the post-mortem discussion where not only do film geeks exchange their own views about what they just saw but they get to dissect everything from the actors to the music to the structure itself. Admittedly, a good percentage of casual moviegoers are happy to just sort of dismiss or recommend a film with one sentence — namely, they either dug it or they didn’t. However, for film buffs it goes several steps beyond that and for critics, often the discussion can get far more intense. The press screening for Traitor was no exception as a small group of the Phoenix media exited the darkened theatre into the brightly lit lobby in the early afternoon (a time that I think most will agree isn’t the most conducive for the “event atmosphere” of theatre-going). In an impromptu conversation, we quickly moved away from the general consensus of liking it and recommending the film (for the note-taking studio PR rep) and focused our attention to an entirely different and more urgent problem altogether. More specifically, our problem was this: just how the hell were we supposed to write about a film that demands such an extreme element of surprise? A few critics joked it would be the shortest summary in movie history and lamented the fact that even the title gives something away! Likewise we didn’t envy the studio marketing team who obviously would have their work cut out for them in not revealing spoilers. And while the first few trailers for writer/director Jeffrey Nachmanoff’s film (which surprisingly came from an original story idea by comedian Steve Martin) just showcased the film’s breakneck pace, emphasis on action, and globe-hopping structure, sure enough the most recent commercials reveal darn near every single surprise. Therefore, if you find yourself face-to-face with a Traitor trailer or commercial, close your eyes and plug your ears as they should be avoided at all costs. Simply put — Traitor is the cinematic equivalent of a house of cards and its success will topple if word gets out too soon. So in the spirit of trying not to give anything away and avoid forcing my readers into the legions of those already in the know thanks to the ads, you’ll have to forgive a perfunctory synopsis. 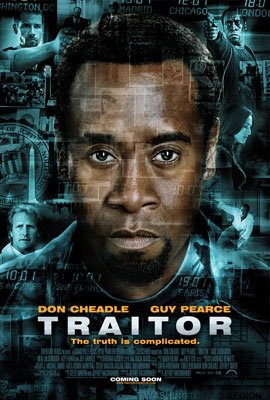 Essentially Traitor tells the story of elite, contemplative FBI investigator Roy Clayton (Guy Pearce) who pursues the path of American citizen Samir Horn (Don Cheadle) who is linked to a group of international terrorists. Predictably, Clayton discovers — and I’m sure the title does cause most imaginations to run overtime — that there may be more to Horn’s story than it would appear. Quicker than you can say “Jack Ryan meets Jason Bourne,” the film steps into high gear at its halfway point, making the second (and far more successful hour) all about political espionage, intrigue and conspiracy. A high tech version of cops and robbers in our post 9/11 world, Traitor does suffer from its delusions of grandeur and the fact that a revelation about two characters that comes in at the hour mark may have made the film’s script much stronger if audiences had been in on this from the start. Not to mention, seven years after 9/11, we’ve begun growing weary of similar sounding rhetoric and Traitor’s screenplay is in desperate need of a polish as — due to its sometimes overly politically correct and sound-byte heavy dialogue — Pearce and Cheadle are forced to preach about religion far too often. And in the same token, the terrorists deliver speeches that sound like your run of the mill, anti-American propaganda we’re faced with on a daily basis in the media. Still, while it falls short of its goal to be a new Bourne Identity entry or successor to Tom Clancy’s famous Jack Ryan series, Traitor never fails to entertain and does that job quite well. Additionally, it’s bolstered by wonderfully edited action sequences that ratchet up the tension as well as a top-notch cast headed up by one of my favorite character actors, Don Cheadle (who also produced). While Pearce, Jeff Daniels, and Neal McDonough are all uniformly excellent, look for Traitor’s surprising scene stealer Said Taghmaoui (The Kite Runner, Vantage Point) who can next be seen playing Breaker in the hotly anticipated big screen adaptation of the Gen X favorite action figure — G.I. Joe: Rise of Cobra.